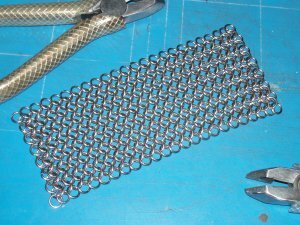 This will be nothing new to the 'old hands', but might be interesting for some 'newbies' that look for an economic way to make E4-1 (European 4 in 1) sheets for larger maille projects. And this is my personally preferred method that somewhat "crystallized" during three larger procects. Other (say: more experienced) maillers may have other preferences. 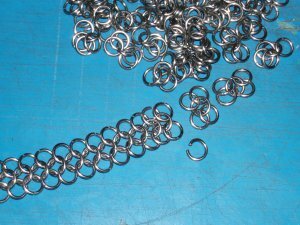 Use rings with an AR of 3 or higher - the samples use AR~4.6 rings (Stainless 1.2mm coiled on 5mm mandrel, plus springback). 1. 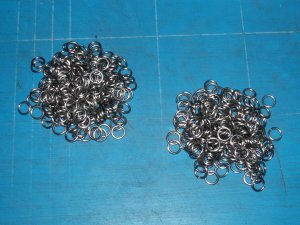 Take or make a batch of rings you want to turn into E4-1 during a session, and divide it into two roughly similar sized heaps. 2. Pre-close all rings of one heap; leave the other one untouched now, as its rings will be needed for stitching. 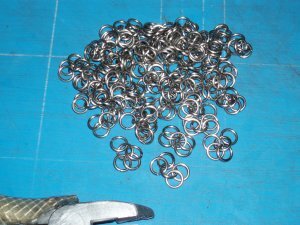 You may pre-open a significant amount of these, but I prefer not to do so, as I hate to fiddle around with a caught up bunch of rings. A side note about pre-opening: Some maillers who make the rings themselves, directly produce the right amount of rings pre-opened - by stretching half of their coils before cutting. 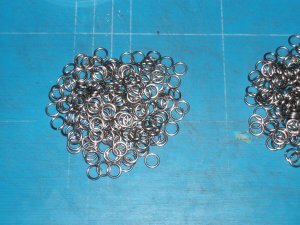 The possible slight differences in finished ring diameter can be mostly ignored, as in the end product the preopened and the preclosed rings end up in alternating rows. Coil stretching is a controversial technique, and has the potential to produce malformed rings. Use at your own risk. 3. Make fivelets out of the preclosed rings by putting four preclosed rings on one open ring and closing it thereafter - using the necessary amount of rings of the other heap. If the number of preclosed rings doesn't fit, just close rings as needed. 4. Stitch the fivelets together to make one basic E4-1 chain. 5. 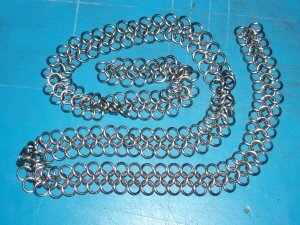 Divide the basic chain into two halves; then stitch the two resulting chains parallel into one double-wide chain. If necessary (in case of not having divided exactly in half the step before) add rings in 'one ring at a time' manner to complete. 6. 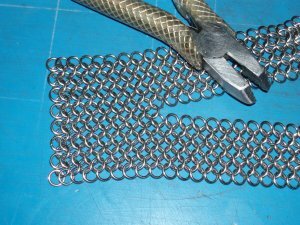 Repeat the last step to make a four-chain (= 15 rings) wide sheet. 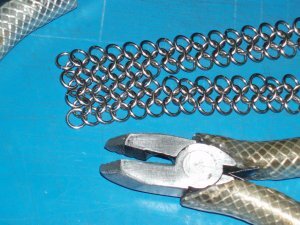 You may re-use the opened-again rings originating from dividing the chains - just intersperse them when joining the chains, but if they got mangled too much, better throw them away. There should remain only a couple of unused rings. These can be returned to the stock, and/or used to append the just prepared sheet to another one already created. This is to build a long, a bit wider strip of E4-1 to tailor shirts or whatever you like, and having always good manageable part sizes and weights, and relatively short times, where the weight of the complete shirt has to be manipulated. 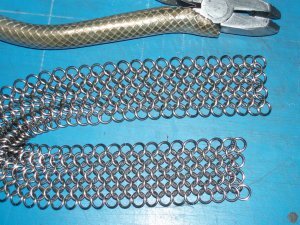 And don't forget to check your strip for weaving errors (having hooked only three - or maybe five - rings into one); these accidental expansions or contractions will sometimes occur and should be corrected on the spot.